Kevin Walters is a former Australian and Queensland Maroons representative Rugby League player and premiership-winning captain of the Brisbane Broncos, currently working as an assistant coach for the Brisbane Broncos of the National Rugby League (NRL). Following his former coach Wayne Bennett from the Newcastle Knights he joined the Broncos coaching staff ahead of the 2015 season. 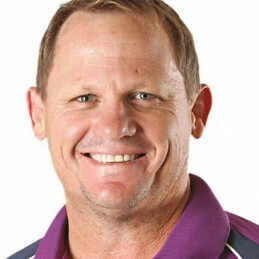 During his short stint with the Knights, Walters was appointed as Halves coach by Bennett in 2014. Before this, Walters joined the Melbourne Storm where he worked as assistant coach to Craig Bellamy. Walters had also been at French club Catalans Dragons of Europe’s Super League where he was head coach. Before that he was head coach of the Ipswich Jets in the Queensland Cup. Along with twin Kerrod and older brother Steve, Kevin Walters started his career in the Brisbane Rugby League premiership before joining the NSWRL. He spent some time playing for the Canberra Raiders before moving to the Brisbane Broncos, where he played for the majority of his career and took over the club’s captaincy. He has played in premiership-winning teams on six occasions and holds the record for most finals appearances.